Date 1558. 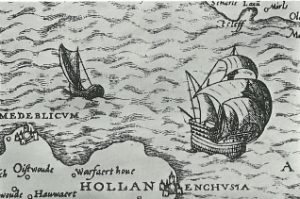 Showing typical rig for the medium-sized ship of the period and boat with spritsail (from a Dutch chart of 1558 in C. H. Coote’s collection). Click here to start reading or download a pdf of this Chapter.